Image caption The Big Bang Theory is a popular American sitcom focusing on a group of highly intelligent but socially inept "nerds"
A member of staff at a Scottish school was told to "watch The Big Bang Theory" as training to deal with a pupil with Asperger syndrome, MSPs have been told. Holyrood's education committee took evidence on support for pupils with additional needs. Sylvia Haughney, a support for learning instructor, said there was not enough teacher training. She said a support worker had been advised to watch American sitcom The Big Bang Theory as a form of training. Colin Crawford, head of inclusion in the council's education services department, accepted there may need to be a review of what training teachers need, but said this should apply when they are at college as much as when working in schools. The Big Bang Theory is a popular American sitcom focusing on a group of highly intelligent but socially inept "nerds". 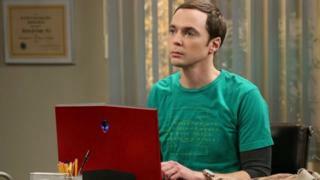 One character in particular, Sheldon Cooper, is often singled out by viewers as behaving in a manner consistent with Asperger syndrome, a developmental disorder on the autism spectrum. However, the programme's creators have stated that they did not use the syndrome as a basis while creating the character, having said they are "uncomfortable labelling" him as having Asperger's. Ms Haughney, who has been a support for learning instructor in Glasgow for over 34 years and represents the union Unison, said there had been much better training for dealing with pupils with additional needs when she was going into the profession. She said: "We were given the training, so we had an understanding. It was direct training, from a psychologist, from a speech language therapist, to give us an understanding and a knowledge of what we were looking for, who we were dealing with and how to go to the next step with that pupil. "That is just gone. We have this 'cascading' training, from someone coming and saying 'oh I went on a course, and this is what we do'. "Recently I was in a school and I asked a member of staff who was working specifically with a child with Asperger's, what training have you had in Asperger's? 'I was told to watch The Big Bang Theory'. "That's the level of training that we've got now in schools." Ms Haughney later said the issue of using cascading in lieu of direct training was "really serious", adding that "if someone has bad practice, they are passing on bad practice". Prof Sheila Riddell from the University of Edinburgh added that the training for children with additional support needs is "very, very patchy in Scotland". Mr Crawford said there needed to be "creative thinking" about training, amid "huge challenges" of upskilling a large workforce. He said the council worked with other organisations to deliver training, with online courses available too. He said: "There are a range of developmental checklists, some of which are extremely useful in terms of child development. "But what I wanted to say is I think there are also issues here in terms of initial teacher training, and the training that's offered at colleges to support staff, in terms of upskilling them before they go into the profession. It's not necessarily always down to local authority training once staff are in place. "There's a stage before that which needs to be addressed as well in the preparation for going in to working with children and young people." Later in the session he added: "We've focused a lot on training this morning, but what training? Maybe it's about, are we needing to think about a training needs analysis of all staff that would give us that baseline of exactly what training staff need to make them feel more confident in the day to day job that they're doing."